Round Table on South Sudan and the DRC (PE nr. 1089 – 2018/03) | M.Afr. I thank the organisers for having invited me to speak at this round-table on South Sudan and the Democratic Republic of the Congo (DRC). I arrived in the DRC for the first time in 1971 and I have felt a deep union with this country ever since. For a number of years, I have been involved in Bukavu (South Kivu) with the reception and reintegration of victims of violence based on gender, especially women and children. At the moment, I am collaborating with the Justice and Peace Commission of the USIG/USG in the training of religious for the reception, care and reintegration of victims of violence. It is in this capacity that I am speaking. My remarks today are not to describe the drama that has convulsed the DRC for more than 20 years, which has caused millions of deaths that nobody talks about. Other speakers will discuss this topic later on. 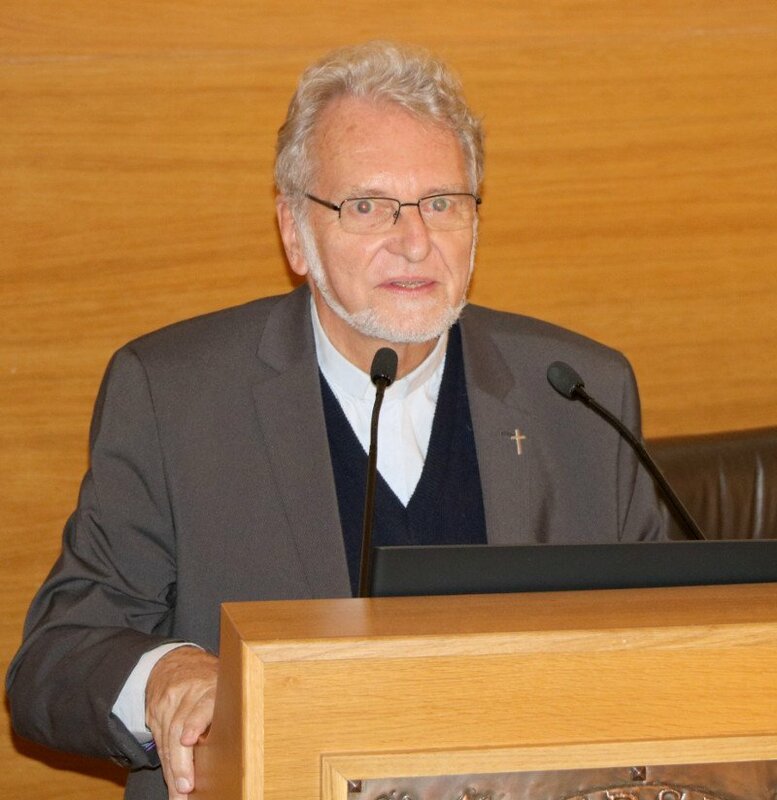 I would like to allude to the unique commitment of the Church and particularly the consecrated people who support the victims of violence on the ground and who pursue the aggressors. I will also refer to the inseparable link between compassion, indignation and solidarity which is the only way to promote a just peace in the DRC and other places. Tonight, I want to reiterate my deep conviction that in this regard, the Church can make the difference in promoting a just peace in the name of the Gospel. This conviction is based on a recent experience I had in the framework of training consecrated people organised by the USIG/USG and which I now want to develop. The irreplaceable contribution of consecrated people in the fight against gender-based violence. I should make it clear that a part of what I am going to say can also be applied to the many lay people engaged in this area and who work for Caritas or JPIC. However, I would like to draw a certain number of lessons from a training session which was organised recently by the JPIC Commission of the USIG/USG at Goma in the east of the DRC. In May 2016, a British Government Minister asked to meet the JPIC Commission of the USIG/USG in Rome after a visit to North-Kivu. She had noted the high degree of involvement of consecrated people in the areas of violence in this region. This is why she officially asked that the consecrated people help her Government to make known in the country the “International Protocol on the Documentation and Investigation of Sexual Violence in Conflict” In October of the same year, it was decided to organise some training for consecrated people who were working in this area. It took place in Goma (South Kivu) in April 2017. I was entrusted with the task of organising it. During this session, four days were devoted to a psycho-spiritual and pastoral approach and two were spent in presenting the International Protocol by experts from the British Government. About forty religious and diocesan priests from the DRC, Rwanda and Burundi who were actively engaged in welcoming victims and survivors participated. It was the first time that the British Government made such a request to Catholic religious. It was a pilot experiment. Then I asked myself: why did the British Government take this unusual step of approaching Catholic consecrated people on this matter? It is here that I believe that consecrated people make the difference, even if some NGOs do good work and are, in some cases, more professional. The fact is that consecrated people come from the district and know the local culture. They have their own particular experiences of the area from their family backgrounds. They have a lifelong dedication which extends way beyond a commitment for a particular project. They are supported by their religious communities and by parishes and work on the basis of a long term presence and not just on the basis of a temporary agreement. The network of religious is spread throughout the DRC and is in touch with the people. USUMA and ASUMA, at both the national and diocesan level and in conjunction with local groups of JPIC and Caritas weave a complete network over the country and have access to a unique circulation of information and interventions in the field, sometimes in inaccessible places. They have also benefitted from a long human and spiritual formation which gives them a particular credibility. No doubt some need more professional training but their consecration to God means that they benefit from the trust the people have in them. However above all that, their model of commitment is that of Jesus, their foundation is the Gospel plus the Social Teaching of the Church and their strength comes from their daily sacramental and prayer life. This last point is essential. It is not possible to be plunged on a daily basis into a battle with absolute evil that is represented by the terrible violence that is perpetrated every day against women and children without drawing daily from the strength received from the contemplation of the Cross of Christ in whom “everything is accomplished”. 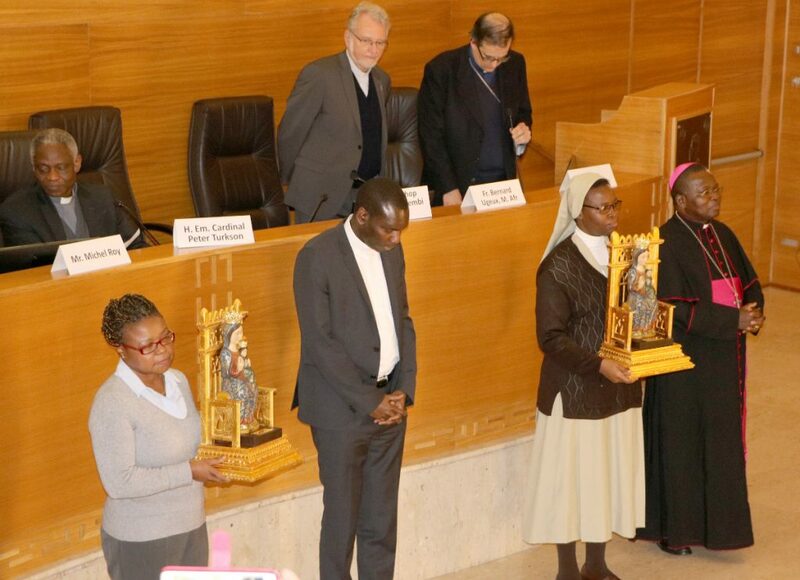 Reception and presentation of statues of the Virgin Mary who intercedes for peace in South Sudan and the DRC. In the commitment of the Church, do not separate the link between compassion, indignation and solidarity. A committed Christian following Christ in the search for Justice and Peace should march on the two legs and two hands of compassion and indignation. Moreover, such a person should always act within the Church, hence the importance of solidarity. It seems to me that these three dimensions are inseparable. This is what I read into the decision of the Holy Father when he set up the Dicastery for Promoting Integral Human Development and it is also in the Dakar Declaration of Caritas Africa . 1. Regarding compassion: In the course given at Goma, we found that much of what we shared could be found in the convictions of Pope Francis comparing the Church to that of a “field hospital” and consecrated people being present at the peripheries taking on the odour of their flock. In a hymn in the French breviary, we sing, “Who then is God that can be hurt so much by wounding man.” Abbé Pierre, so well-known in France, affirms that “love is: when you suffer, I hurt.” We need to stop the underestimation of evil, indifference, and contempt for women. Certainly, one should cry with those who cry, but also and especially one needs to look for concrete solutions. True compassion is not only to feel empathy for a victim that is only the starting point. It should be followed by the search for effective means to permit the victims to regain their self-esteem, to rediscover their independence and their social identity. All this requires not only medical and psychological treatment but lots of tender loving care, a lot of listening time, unlimited patience and spiritual accompaniment. Here we can refer to the Apostolic Letter of Pope Francis addressed to consecrated people on the occasion of the Year of Consecrated Life and in Misericordiae Vultus promulgated for the Year of Mercy. the law, the social teaching of the Church and to try to practice a true discernment in the middle of violence. 3. This why I finish with the importance of solidarity. An isolated Christian is in danger of death. Christians limiting themselves to personal devotions and novenas forget that the Body of Christ is not confined to the tabernacle, but is to be found in every suffering brother and sister. It is in the Church, in the religious communities, in small Christian communities, in parishes and dioceses that we can make a difference. In is in this way that the Church can acquire and exercise a true competence and credibility in the eyes of the people and governments. This is especially so when she is transparent at the level of the use she makes of the means she receives from outside or which comes from the solidarity of the local communities. This meeting in Goma was followed by a renewed commitment on the part of a big number of participants in favour of the victims especially in the areas of listening and follow up care, by the creation of small reflection and action groups throughout the DRC. It also gave birth to a manual going back over the methodology and contents of the workshop. It has been distributed in French and English, and it is intended to be adapted and used freely where people are victims of gender based violence. To sum up, I believe that Catholics, particularly consecrated people can bring a unique witness in this ravaged country. I also believe that we should never let go of the pivot between compassion, indignation and solidarity if we want to be faithful to the intuition and teaching of the Holy Father and to the example of Christ who reminds us this evening that “…whatever you did for one of these brothers and sisters of mine, you did for me” (Mt 25,40). Everywhere we are, those of us who are here today, let us take the necessary initiatives so as not to let our Round Table be without concrete consequences on the ground. Let us inform ourselves, have the courage to denounce, support those who are far away and give priority to the most vulnerable around us. Today, in Southern Sudan and in the DRC and elsewhere in Africa, Christ is undergoing his passion under our eyes. Let us not leave him alone.